Now that the snowdrops are in full bloom and the crocuses are up, it won't be long until we see the first daffodils and narcissi. With that in mind I've coloured my Narcissus digi image from A Passion for Stamps and then made some 3D Narcissi to match using my Tonic Studios Petal Pairs punches. 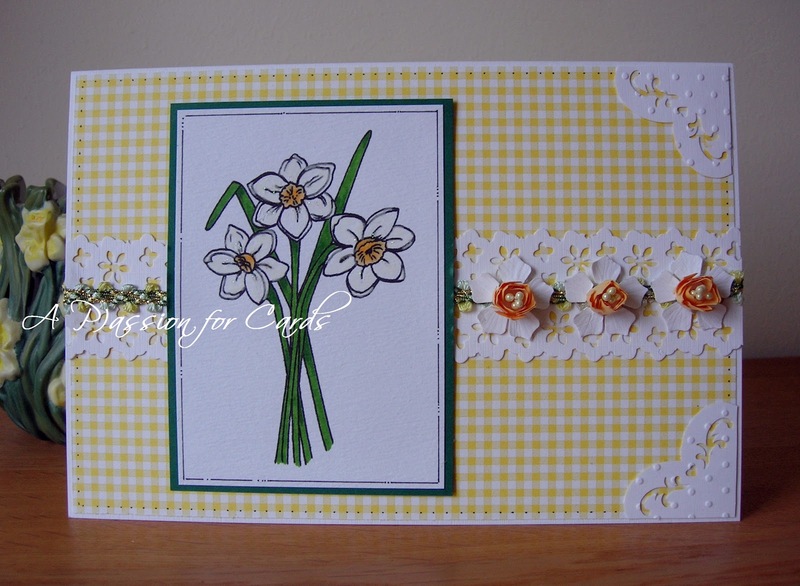 I made a little strip for the centre of the card using the Floral Border Simplicity geared punch and created "corners" by trimming the Multi Detail Heart punch to fit and embossing it with Cuttlebug's Swiss Dots folder. The flowers are fairly self explanatory but if anyone needs some pointers feel free to ask. There will be another giveaway announced on Blog Tonic in the next day or two so do nip over and join in!